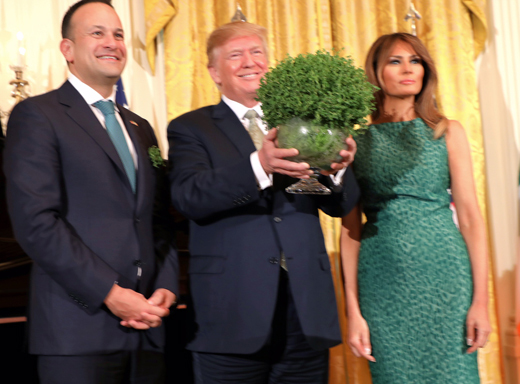 Irish prime minister Leo Varadkar upheld the 65-year-old tradition of presenting the U.S. president with a bowl of shamrocks in March as part of his first state U.S. visit. His week-long trip included meetings with Vice President Mike Pence, Texas governor Greg Abbott, and New York City mayor Bill DeBlasio. Varadkar also attended an event honoring the 20th anniversary of the Good Friday Agreement and marched in the New York City St. Patrick’s Day Parade alongside this year’s Grand Marshal, Loretta Brennan Glucksman. Varadkar made a special point of stopping in Oklahoma, where he spoke to the Choctaw Nation in Durant, thanking them warmly for their ancestors’ charitable collection for the Irish during the Great Hunger. The statement Taoiseach Varadkar makes in the last paragraph reminds one of the Bloody Sunday killings in Derry in late Jan. of 1972 and the torture and waterboarding of LIAM HOLDEN in Sept. of that year, which caused this innocent teenager to confess to a crime he DID NOT commit and for which he served 19 years in a Belfast prison. The first St. Patrick’s Day parade was held in N.Y.C. 191 years before the first bowl of shamrocks was presented by a Taoiseach from Ireland to a U.S. President. From its inception in 1762, this annual event in America’s largest city always represents the WHOLE Irish nation, but every Taoiseach since the establishment of the Independent Irish State has represented only that part of Ireland – never Ireland as whole nation. Fore more than 2 centuries before the mid-1960s, successive waves of immigrants from ALL parts of Ireland made significant contributions to the American nation, but since about 1965, the U.S. doors to would-be Irish emigrants have been tightly closed. All you say is completely true, True with a capital “T”, and the U.S. doors being tightly closed to would-be Irish emigrants was done by President John F. Kennedy. As the French proverb says, “one is never better betrayed than by his own”, (or “one of his own”). If the 1965 immigration laws had been enacted 20 years sooner, the U.S would have deprived itself of at least 3 Bronze Stars recipients and one Silver Star winner, which were Irish immigrants at that time. The Bronze Star winners included Sgt O’Brien of Emly, Co. Tipperary, who later lost in life in Korea and whose body was never recovered. By keeking its doors shut to Irish immigrants, the U.S. is depriving itself of thousands who whould make very valuable contributions to the nation.